(Nanowerk News) MIT has established a formal relationship with Tecnológico de Monterrey, one of Latin America’s largest universities, to bring students and faculty from Mexico to Cambridge for fellowships, internships, and research stays in MIT labs and centers. The agreement will initially focus on research at the frontier of nanoscience and nanotechnology. 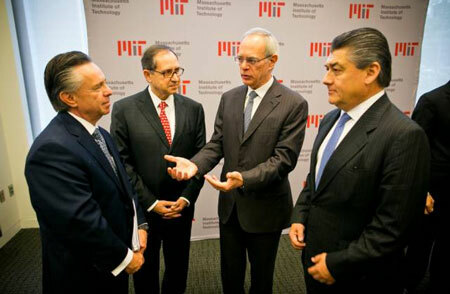 The agreement was celebrated today with a signing ceremony at MIT attended by a delegation from Tecnológico de Monterrey that included President Salvador Alva; the chairman of the board of trustees, José Antonio Fernández Carbajal; Mexico’s ambassador to the United States, Eduardo Medina Mora; and Daniel Hernández Joseph, the consul general of Mexico in Boston. (Left to right): Eduardo Medina Mora, Mexico’s ambassador to the United States; Tecnológico de Monterrey President Salvador Alva; MIT President L. Rafael Reif; and José Antonio Fernandez Carbajal, the chairman of the board of trustees at Tecnológico de Monterrey. The agreement sets the stage for increasing long-term cooperation and collaboration between the two universities with an initial academic program that will enable undergraduates, graduate students, postdocs, and junior faculty from Tecnológico de Monterrey to visit the MIT campus, where they will be embedded in labs and centers alongside MIT faculty and students. The participants will gain direct experience in disciplines and topics that match their interests. The program may change or expand its focus after five years. MIT is currently constructing a new facility, MIT.nano, that will be a key resource for future extensions of the program. The new 200,000-square-foot facility, which is being constructed on the site of Building 12 at the center of the MIT campus, will house state-of-the-art cleanroom, imaging, and prototyping facilities supporting research with nanoscale materials and processes — in fields including energy, health, life sciences, quantum sciences, electronics, and manufacturing. In honor of the new relationship, the facility’s Computer-Aided Visualization Environment will be named after Tecnológico de Monterrey, says Vladimir Bulovic, the Fariborz Maseeh Chair in Emerging Technology and faculty lead for the MIT.nano building project. “When it is completed, MIT.nano will enable students and faculty from Tecnológico de Monterrey to learn and work in one of the most advanced facilities in the world and will give them invaluable experience at the forefront of innovation,” says Bulovic, who is also the associate dean for innovation in MIT’s School of Engineering and co-chair of the MIT Innovation Initiative. Tecnológico de Monterrey is one of the largest universities in Latin America, with nearly 100,000 high school, undergraduate, and graduate students; 31 campuses in Mexico; and 19 international locations and branches in the Americas, Europe, and Japan. This week’s agreement establishes a new relationship between MIT and Tecnológico de Monterrey, but the two institutions have a shared history. Tecnológico de Monterrey was founded in 1943 by Eugenio Garza Sada, who graduated from MIT in 1914 with a degree in civil engineering. After studying at MIT, Garza Sada — with his brother, Roberto, who graduated from MIT in 1918 — grew his family’s brewery in Mexico into a company that today is known as FEMSA, the largest beverage company in Mexico and Latin America. Tecnológico de Monterrey’s founding director-general was León Ávalos Vez, a mechanical engineer from the MIT Class of 1929. The new program will commence next spring, with the first students and faculty targeted to come to MIT next summer.